On the last weekend of July, Tweedvale Pipe Band travelled to Levengrove Park, Dumbarton to take part in the Scottish Pipe Band Championships. This was the second Major Pipe Band Championships of the season that the band had taken part in and saw the band play 11th out of 16 bands. The performance was not of the best – unsettled throughout with mistakes all the way through the performance, though why this should have been is still unknown as the pre-contest warm up had gone well. When the results were announced the band found itself placed 13th out of 16 bands, with the piping adjudicators giving the band 5th and 16th, places, the drumming judge 13th place and the ensemble judge 15th place. 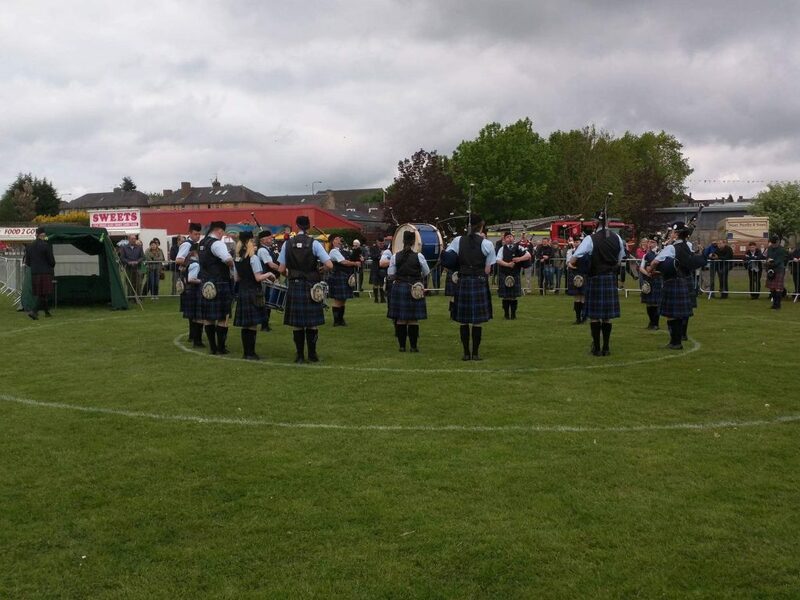 Speaking about the contest result, Tweedvale Pipe Major Bruce Gillie said “I’m at a loss to explain what happened with the performance at the Scottish Championships, it was by far the worst of the year”. Contest venue – Levengrove Park Dumbartion. Grade 4A MSR – P/M Donald McLean’s Farewell to Oban, Men of Argyll, Molly Connell, The Keel Row, Lexy McAskill and Flora, Mrs MacLeod of MacLeod. Number of Pipers – 11. Number of Side Drummers – 4. Number of Bass Drummers – 1. Number of Tenor Drummers – 3. The full results of the Scottish Pipe Band Championships Grade 4A March contest can be found here. Brilliant Bathgate Bring Out Best in Tweedvale Pipe Band!! 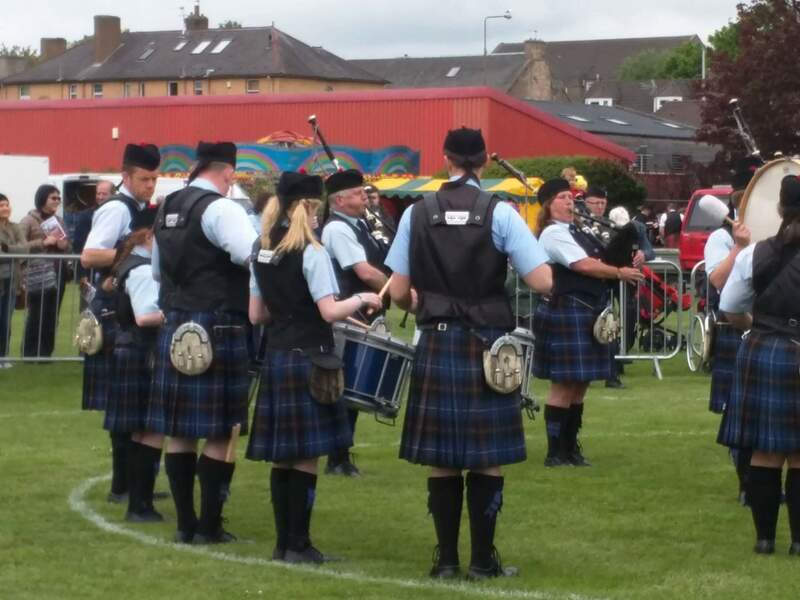 The last Saturday of May saw Tweedvale Pipe Band travel the short distance to West Lothian to take part in the pipe band contests at the West Lothian Highland Games, which were held in Meadow Park Bathgate. Tweedvale Pipe Band had entered three of the pipe band events on the day and was thus assured of a busy day. The band was drawn to play first in the Grade 4 March event out of 8 entered bands. Playing in beautifully sunny and warm conditions, Tweedvale played their March set for the second time in outdoor competition this season. The consensus of opinion from the band members in the post-performance analysis was that the performance was pretty poor, with a poor introduction to the set and at least one obvious mistake; the waste of a decent sound. Undeterred by this first showing of the day the band then continued on to perform in the Grade 4 and NJ March Strathspey and Reel contest. Continuing to enjoy great sunny weather, this performance was much improved on the G4 marches but there were still too many slips being made. The Pipe Major thought this was quite unexplainable given that nothing like this had been demonstrated at practices in the run up to the Bathgate contest. Tweedvale’s third run of the day was in the Grade3 contest which was also a March Strathspey and reel contest. The general opinion of the band was that this run was by far the best of the day. When the results were announced, the band’s own opinion of their performances were found to be markedly at odds with the judges as Tweedvale Band found itself placed FIRST in the Grade 4 March contest winning the John Russell Trophy, and a substantial cash prize to boost the coffers. Both piping judges, the drumming judge and the ensemble judge all placed the band first in the grade leading to the overall prize. Tweedvale also found itself placed FIRST in the Grade 4 & NJ MSR contest, with the judges this time placing the band first and second for piping, and second for both drumming and ensemble leading to the award of FIRST place and the RSPBA Lothian and Borders Cup. Even more silverware was to come the band’s way when the Grade 3 contest result was announced – a second place was awarded to the band, with all four judges in unanimous agreement over the second place. This was a great result for the band considering that the band only entered the event on the day to give themselves extra practice at their March Strathspey and Reel set. Grade 3 was won by Wallacestone & District Pipe Band. 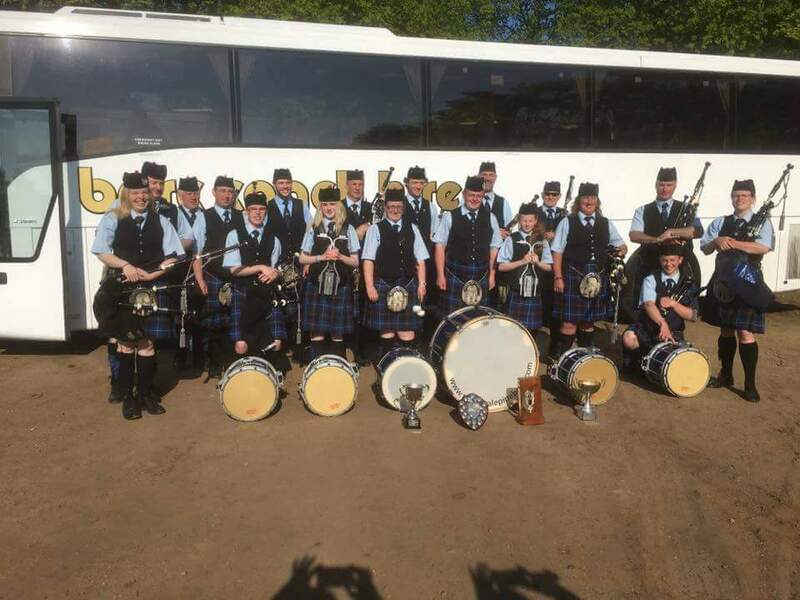 Thus after a long and successful day’s piping and drumming in some spectacularly sunny weather, the Tweedvale bus, kindly supplied by BARC Coach Hire, made its way back home filled with silverware, prizemoney for band coffers and a bunch of happy pipers, drummers and supporters!! These results have boosted Tweedvale Pipe Bands standing in the RSPBA Lothian & Borders Branch Champion of Champions table. This is a ranking of the performance of all local branch bands over the six contest held in the branch area. After two events, Tweedvale Pipe Band is holding its own in the Grade 4 table with one first place and one third place giving a total of nine points and first place in the table. Tweedvale’s contest season will resume in late July when they band will participate in the Scottish Pipe Band Championships. In the intervening time the band will, as Innerleithen Pipe Band, be taking part in local festivals including the Peebles Beltane, the Walkerburn Summer festival and the St Ronan’s Border Games week, as well as undertaking further fundraising events including its annual coffee morning which is being held this coming Saturday 04 June. Contest venue – Meadow Park Bathgate. Grade 4 Marches: Greenwoodside, The Earl of Mansfield, McKay’s Farewell to the 74th and The Piper’s Cave. Grade 4 & NJ MSR – P/M Donald McLean’s Farewell to Oban, Men of Argyll, Molly Connell, The Keel Row, Lexy McAskill and Flora, Mrs MacLeod of MacLeod. Grade 3 MSR – P/M Donald McLean’s Farewell to Oban, Men of Argyll, Molly Connell, The Keel Row, Lexy McAskill and Flora, Mrs MacLeod of MacLeod. Number of Side Drummers – 5 in Grade 4 Marches, 3 in Grade 4 & NJ MSR and Grade 3. Number of Tenor Drummers – 1. The full results of the Bathgate Pipe Band Contest Grade 4 March contest can be found here. The full results of the Bathgate Pipe Band Contest Grade 4 & NJ MSR contest can be found here. The full results of the Bathgate Pipe Band Contest Grade 3 MSR contest can be found here. Tweedvale Pipe Band travelled to Paisley on Saturday 21 May to take part in the British Pipe Band Championships at St James’ Playing Fields, the first major championship of the RSPBA season. The event enjoyed good weather, sunny though breezy – notwithstanding a heavy shower mid-afternoon after the band had played. – though a more pressing distraction for some bands was the sound of aircraft taking off from Glasgow Airport, which was separated from the contest venue by the width of the M8 motorway. The band was drawn to play 15th out of 18 bands and all entered bands played. Playing their March, Strathspey and Reel set of “P/M Donald McLean’s Farewell to Oban”, “Men of Argyll”, “Molly Connell”, “The Keel Row”, “Lexy McAskill” and “Flora, Mrs Macleod of MacLeod”. Tweedvale put in an improved performance from the previous week’s effort at Dunbar, with the general consensus of band opinion afterwards was that the performance was pretty solid with good sound and tempo, and few errors. When the results were announced Tweedvale found that it had been placed 16th overall, which was a disappointment to the band who thought their performance was worth a higher placing. The piping judges gave the band placings of 17th and 15th whilst the drumming judge placed the band 17th and the ensemble judge 10th. The Grade 4A contest was won by the City of Inverness Pipe Band. Tweedvale Pipe Band’s attendance at the British Pipe Band Championships was made possible by a generous donation towards coach costs from The Royal Bank of Scotland Peebles Branch, to whom the band extends its grateful thanks. Band thanks are also offered to BARC Coach Hire for supplying the coach that took the band through to Paisley. Tweedvale Pipe Band’s season continues this Saturday 28 May when the band will be found heading to West Lothian to take part in the pipe band contest at the West Lothian Highland Games in Meadow Park, Bathgate. The Bathgate contest will see the band performing three times – once with its March set of “Greenwoodside”, “The Earl of Mansfield”, “MacKay’s Farewell to the 74th” and “The Piper’s Cave” in the Grade 4 March contest and twice with its MSR set of “P/M Donald McLean’s Farewell to Oban”, “Men of Argyll”, “Molly Connell”, “The Keel Row”, “Lexy McAskill” and “Flora, Mrs Macleod of MacLeod” in the Grade 4 & NJ MSR contest and the Grade 3 competition. A slightly later departure time of 08.00am will see the band through to West Lothian in good time to take the field 1st out of 8 bands in the Grade 4 March contest commencing at 11.15am, followed by the other events throughout the day. Grade 4 MSR – P/M Donald McLean’s Farewell to Oban, Men of Argyll, Molly Connell, The Keel Row, Lexy McAskill and Flora, Mrs MacLeod of MacLeod. Number of Pipers – 9. Number of Side Drummers – 3. The full results of the British Championships Grade 4 MSR contest can be found here. 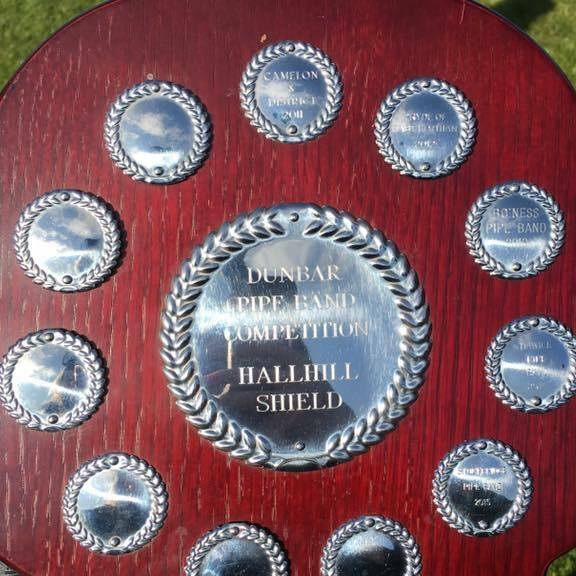 At the Double for Tweedvale Pipe Band at Dunbar!! Tweedvale Pipe Band travelled to East Lothian last Saturday 14 May to take part in the thirty fourth annual pipe band contest at the Hallhill Centre Dunbar, traditionally the first outdoor pipe band contest of the new season in the Lothian and Borders area. Travelling through to Dunbar, the weather promised to be ideal with plenty of sun. This was deceptive however as there was a considerable chill in the air even though the sun continued to shine, these conditions making the setting up of a pipe band sound difficult. Tweedvale were entered in two competitions at Dunbar, the Grade 4 March contest and the Grade 4 and Novice Juvenile March Strathspey and Reel (MSR) contest. The March contest came first and playing their set of “Greenwoodside”, “The Earl of Mansfield”, “MacKay’s Farewell to the 74th” and “The Piper’s Cave”, Tweedvale put in a very creditable performance. The band played 4th out of 17 bands in the March contest and then had a short break before commencing on the MSR contest. In another good performance playing 4th out of 9 entered bands, Tweedvale played their MSR set of “Donald McLean’s Farewell to Oban”, “Men of Argyll”, “Molly Connell”, “The Keel Row”, “Lexy McAskill” and “Flora, Mrs Macleod of MacLeod”. When the results were announced Tweedvale found that it had been placed third overall in the March contest, winning the Hallhill Shield. Closer examination of the results showed the band’s piping placed sixth & second, the drumming fifth and the ensemble second by the judges. The Grade 4 March contest was won by Dunbar RBL Pipe Band. Other Scottish Borders bands took part in the Grade 4 March contest with Stow Borders coming second, Hawick coming eight and Peebles Ex-servicemen’s tenth. Moving on to the Grade 4 & NJ MSR contest results, Tweedvale again placed third overall with band’s piping placed second & third, the drumming sixth and the ensemble third by the judges. The MSR contest was won by George Watson’s Novice Juvenile Pipe Band. Tweedvale Pipe Band’s attendance at the Dunbar pipe band contest was made possible by generous donations towards coach costs from The Bridge Inn Peebles and Innerleithen Union Club to whom the band extends its grateful thanks. As Pipe Major Gillie mentioned, the British Pipe Band Championships take place in St James’s Playing Fields Paisley this Saturday 21 May. Tweedvale Pipe Band has been drawn to play 15th out of 18 bands in the Grade 4A contest, and will be taking to the contest field at 12.08pm. This draw means an early start for the band with the coach leaving Innerleithen at 7.30am. The playing requirement for the first major championships of the year is a March Strathspey and Reel set and will be the same was as that played at Dunbar. The following weekend sees the band heading to West Lothian to take part in the pipe band contest at Bathgate on the last Saturday of May. Contest venue – Hallhill Centre Dunbar. Number of Pipers – 10. Number of Side Drummers – 6 in Grade 4, 3 in Grade 3. The full results of the Dunbar Pipe Band Contest Grade 4 March contest can be found here. The full results of the Dunbar Pipe Band Contest Grade 4 & NJ MSR contest can be found here. Winter is generally a quiet time for pipe bands with preparation for the forthcoming pipe band season and fundraising featuring heavily in band activity. Innerleithen Pipe band has been no different. This post is a summary of band activity in the first few months of 2016. New Year’s Day saw the band play round pubs and clubs in Innerleithen, a long standing tradition. Starting off at the Vale Club and moving on to Lodge 856 Social Club, the Union Club and St Ronan’s Hotel in turn, the band played half a dozen well received sets before partaking of some light refreshment in each establishment. 1. ATTENDANCE – 19 band members attended. 2. MINUTES OF 2015 AGM – the minutes of the 2015 AGM were approved by the meeting. There were no matters arising. 3. ACCOUNTS – the treasurer tabled accounts for 2015 and spoke to them. Total Receipts in 2015 were £8379, total payments were £12973 leaving a deficit of £4594. The deficit was mostly comprised of tuition costs, increased expenditure on buses(resuming competitions) and expenditure on the Band Hall refurbishment. Bank account balances at the year-end comprised £2675. 4. COMMITTEE REPORT – the secretary tabled the committee report, which was accepted by the meeting. 5. COMMITTEE ELECTION – the current committee stood down but were proposed for re-election. No further nominations were received therefore the committee of Charles Gray, Steven Gibb, Linda Ridley, Bruce Gillie, Rosemary Gordon, Ross McLaren, Jim Doherty, Lynsey Thomson and Bethany Thomson was re-elected for a further year. 6. ELECTION OF OFFICE BEARERS – the current Pipe Major, Leading Drummer and Drum Major stood down but were proposed for re-election. No further nominations were received therefore Pipe Major Bruce Gillie and Leading Drummer Ross McLaren, were re-elected for a further year. The position of Drum Major was left vacant. a. SUBSCRIPTION – a £10 per year subscription fee for ALL BAND MEMBERS was introduced for the first time. b. TUITION CHARGE – it was agreed that a tuition charge be introduced, the level of which was to be set by the committee after the AGM. A meeting with all affected parents/interested parties would then held. c. BUS FARES – for travel to pipe band competitions on band hired coaches, the level of bus fares was set as follows Adult Players £5, Non-Players £7, Under 16s £2. 8. CONTESTS AND ENGAGEMENTS – after discussion it was agreed to try and attend the 5 local pipe band contests at Dunbar, Bathgate, North Berwick, Peebles and Innerleithen and the Majors at Paisley (British), Dumbarton(Scottish) and Glasgow(Worlds) as well as the usual street engagements. On Saturday 30 January, the band held a fundraising Burns Supper in Lodge 856 Social Club, Innerleithen . The event was a great success for the band, raising £475.00 for band funds whilst everyone who attended had a very enjoyable evening’s entertainment celebrating our national Bard. Many thanks go to everyone who turned up to support the event, all who donated raffle prizes, and especially our speakers and performers whose contributions were invaluable – Miss Rachel Anderson who gave The Selkirk Grace, Archie Cousins who piped in the haggis and entertained with a few tunes, John Connor who Addressed the Haggis with customary gusto, Bobby Heaney who gave an impressive Immortal Memory, Jim Borthwick who gave a witty Toast to the Lassies, Rosemary Gordon who gave an equally witty Reply from the Lassies and Jim Calder who gave a fine rendition of Holy Wullie’s Prayer, all of which was presided over in masterly style by the MC for the evening, Alan Thomson. Interspersed amongst the speeches were fine musical contributions from Vi and Charlie Graham which were much appreciated by the company. Special thanks are also due to our chef for the evening Mr David Fulton who provided the company with a wonderful three course meal, ably assisted by Mr Darren Heath and the waiting staff of Anne Tunnah, Anne Shirley, Sharon Heath and Jackie Tunnah. The band would also like to extend its thanks to the committee, members and staff of Lodge 856 Social Club for the use of their function hall to hold the Burns Supper. In comparison with January, February was a quieter month with little band activity. Band members though were busy with various members guesting with the pipe band that annually visits Bailleul in northern France for Carnival. Band members also made the bi-annual pilgrimage to Wales for the Six Nations rugby, performing in various pubs and clubs. March has seen the band hard at work preparing for the forthcoming pipe band competition season. With the band having been downgraded at the end of the 2015 season, new competition sets have to be prepared based on the criteria laid out the the RSPBA. Sets were chosen before Christmas and now the band has them up on the pipes and drums. The sets chosen for this years contest comprise the folloing tunes – a quick march set of “Greenwoodside”, “The Earl of Mansfield”, “McKay’s Farewell to the 74th” and “The Pipers Cave, and an MSR set comprising “Donald McLean’s Farewell to Oban”, “Men of Argyll”, “Molly Connell”, “The Keel Row”, “Lexy McAskill” and “Flora, Mrs MacLeod of MacLeod”. The bands next fundraising event is also in hand. The annual PipeBand-A-Thon will be held on Saturday 26 March from 8.00am to 8.00pm in the Vale Club Innerleithen. Not only is this one of the main annual fundraisers for the band, it is a great opportunity for the band members to have a practice day working on tunes and instruments prior the the new pipe band season commencing in early May. New for this year is the band signing itself up for JustGiving to allow supporters to pledge donations online – this has been a spectacular success with the band raising well over £1000 by the first week of March. 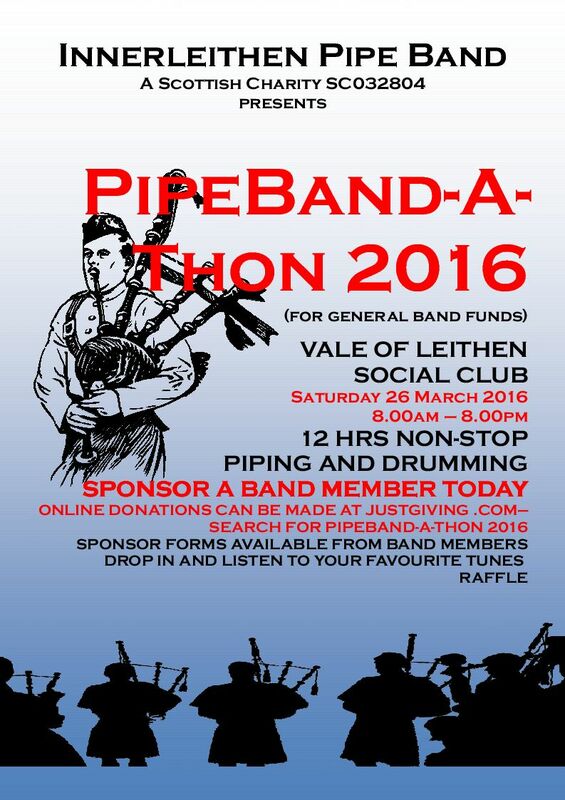 The band’s campaign page can be found here – PipeBand-A-Thon 2016. Tweedvale Pipe Band’s close season started with the disappointing news that the band has been downgraded by the Royal Scottish Pipe Band Association (RSPBA) from Grade 3B to Grade 4A with immediate effect. The band found out the news directly from the RSPBA’s website on 22 September, just days after the RSPBA’s Music Board had met to regrade bands at the end of the 2015 competition season (full listing of all regradings here). Twenty bands were moved up the grades whereas eight bands were moved down. No formal communication of the downgrading has yet been received in writing by the band from the RSPBA but that could just be down to the way the RSPBA works. Though entitled to under the RSPBA’s rules, the band is not planning to contest the downgrading decision. Tweedvale’s planning for next season haven’t been greatly altered following the downgrading news. A major revamp of the band’s repertoire was already on the cards, and it now includes coming up with THREE new contest sets instead of just two. Major fundraising is also planned in order to replace instruments and refurbish uniforms. The band is also keen to attract new members. If anyone is interested in joining a Grade 4A competition band that also has a busy season of street parades and other playing commitments, they are invited to get in touch with the band by turning up at one of the regularly scheduled band practices, on Monday and Thursday nights in the Vale Club Innerleithen, or by surfing to the bands website at www.tweedvalepipeband.com for further information, or by getting in touch via the band’s Facebook page or by emailing the band at innerleithenpipeband@gmail.com. All are welcome, whether experienced musician or complete beginner. Tweedvale Pipe Band’s contest season ended on a high note last Saturday 12 September with their participation in the St Ronan’s Pipe Band Championships. Held in the grounds of St Ronan’s Primary School the Innerleithen contest, as has become a bit of an unwanted tradition, suffered from some atrocious weather conditions. In fact the rain was so torrential that it forced the Novice Juvenile and Grade 4 contests indoors to the school assembly hall. Luckily for the remaining bands and the large crowds, the weather improved through the afternoon allowing the Grade 3 and Grade 2 events, both of which Tweedvale were competing in, to take place out of doors in ever improving conditions. Both of Tweedvale’s performances were markedly better than those of the previous week at Peebles with all band members being much happier with their efforts after they left the field of play. When the results were announced, Tweedvale Pipe Band was placed 4th in Grade 3 winning the William McEwan Memorial Trophy. The Grade 3 contest was won by Stockbridge Pipe Band. Tweedvale were placed 2nd in Grade 2 winning the CLM Consultants Cup, that event also being won by Stockbridge Pipe Band. After the prize-giving ceremony was concluded, Tweedvale Pipe Band, along with several others, paraded from St Ronan’s Primary School to Innerleithen High Street entertaining sizeable crowds that had gathered in the early evening sunshine. Good fortune as well as the sun was shining on Tweedvale Pipe Band as they were also awarded the Joyce Gordon Memorial Shield for best band along the street. The St Ronan’s Pipe Band Championships concluded Tweedvale Pipe Band’s competition season. With the season now over, Tweedvale have been making plans for next season with a revamp of the band’s repertoire on the cards as well as some major fundraising in order to replace instruments and refurbish uniforms. The band is also keen to attract new members. If anyone is interested in joining a Grade 3 competition band that also has a busy season of street parades and other playing commitments, they are invited to get in touch with the band by turning up at one of the regularly scheduled band practices, on Monday and Thursday nights in the Vale Club Innerleithen, or by surfing to the bands website at www.tweedvalepipeband.com for further information, or by getting in touch via the band’s Facebook page. All are welcome, whether experienced musician or complete beginner. The full results of the St Ronan’s Pipe Band Championships Grade 3 contest can be found here. The full results of the St Ronan’s Pipe Band Championships Grade 2 contest can be found here. Grade 3 and Grade 2 – MEDLEY – Bessie Weatherston, Wee Buns, Minnie Hynd, Lonely Loch Nan Eun, Because He Was A Bonnie Lad, The Wisemaiden, Dancing Feet. Number of Side Drummers – 2. Tweedvale Pipe Band’s contest season continued last Saturday 05 September with their attendance at the pipe band contests held as part of Peebles Highland Games. 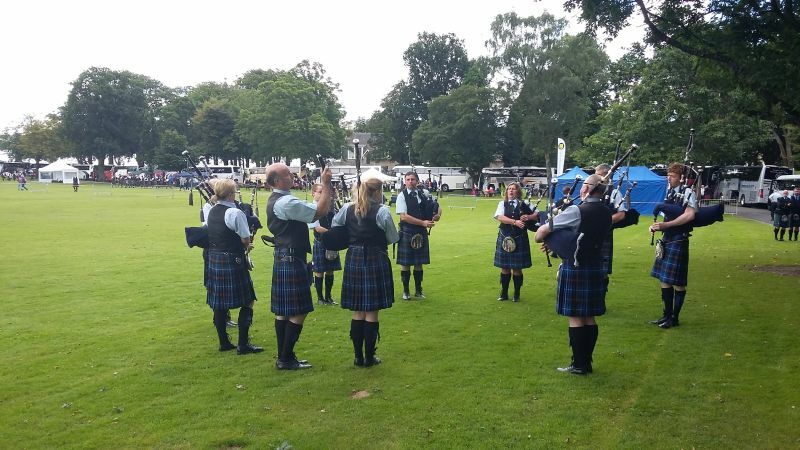 Held in its traditional venue of Hay Lodge Park, the Peebles Highland Games enjoyed some changeable September weather, with bright sunshine, cool breezes and scudding clouds making for a challenging set of conditions in which to set up a pipe band sound. Tweedvale took part in both the Grade 3 and Grade 2 contests, playing their medley selection in both. The band enjoyed variable fortunes in both grades, with the Grade 3 performance being by far the worst performance the band has put in this season. Grade 2 was better but still far from being in prize winning contention. When the results were announced, Tweedvale Pipe Band was been placed 6th in Grade 3. The Grade 3 contest was won by Preston Lodge High School Pipe Band. Tweedvale were also placed 6th in Grade 2 with that event being won by Torphicen and Bathgate Pipe Band. After the prize-giving ceremony was concluded, Tweedvale Pipe Band, along with several others, paraded down from Hay Lodge Park to Peebles High Street entertaining sizeable crowds that had gathered in the early evening sunshine. Tweedvale Pipe Band has one final contest left in their schedule. The band will take part in the St Ronan’s Pipe Band Championships being held at St Ronan’s Primary School this Saturday 12 September. As at Peebles, Tweedvale will take part in the Grade 3 and 2 contests playing their medley set of the tunes “Bessie Weatherston”, “Wee Buns”, “Minnie Hynd”, “Lonely Loch Nan Eun”, “Because He Was A Bonnie Lad”, “The Wisemaiden” and “Dancing Feet”.in both. Tweedvale have also been making plans for the close season with a revamp of the band’s repertoire on the cards as well as some major fundraising in order to replace instruments and refurbish uniforms. The band is also keen to attract new members. If anyone is interested in joining a Grade 3 competition band they are invited to get in touch with the band by turning up at one of the regularly scheduled band practices, on Monday and Thursday nights in the Vale Club Innerleithen, or by surfing to the bands website at www.tweedvalepipeband.com for further information, or by getting in touch via the band’s Facebook page. All are welcome, whether experienced musician or complete beginner. The full results of the Peebles Pipe Band Contest Grade 3 can be found here. The full results of the Peebles Pipe Band Contest Grade 2 can be found here. Tweedvale Pipe Band continued their competition season last Saturday 22 August by participating in the Edinburgh Pipe Band Championships and managed to come away from the event with two 4th place finishes. Held at the Royal Highland Centre Ingliston, the Edinburgh Pipe Band Championships is a much smaller event that the previous week’s World Pipe Band Championships, attracting mainly bands local to the Lothians, Borders and Fife to the 6 grades of competition on offer. Tweedvale Pipe Band arrived at Ingliston just after 11.00am in order to prepare for their performances and found the weather very changeable making the setting up of a band sound very difficult. The band was fortunate to avoid the worst of the weather whilst performing as there were some heavy rain showers in evidence during the day. Scheduled to play first in the Grade 3 event, the band actually played second due to a late entry. The Grade 3 performance was marred by several errors and some nervous playing which led to Tweedvale being marked down by the four judges. The Grade 3 contest was won by the Stockbridge Pipe Band from Edinburgh. The performance in the Grade 2 event was much better than that of Grade 3 with the playing much more relaxed and with fewer errors in evidence. The Grade 2 contest was won by the People’s Ford Boghall and Bathgate Juvenile Pipe Band. The next event in Tweedvale’s competition season is the first of two local pipe band contests at Peebles Highland Games on Saturday 5 September. The band will feature in both the Grade 3 contest, playing 4th out of 9 entered bands, and in the Grade 2 contest, playing 5th out of 8 entered bands. Both grades are Medley events. Following on from the Peebles contest is another local event, the St Ronan’s Pipe Band Championships in Innerleithen on Saturday 12 September which closes Tweedvale Pipe Band’s competition season. Planning for next year has already started with the band starting to consider tunes for a new Medley and a new March Strathspey and reel set. MANY THANKS TO BARC COACHES FOR SUPPLYING THE COACH FOR TRAVEL TO AND FROM THE EDINBURGH PIPE BAND CHAMPIONSHIPS. The full results of the Edinburgh Pipe Band Championships Grade 3 contest can be found here. The full results of the Edinburgh Pipe Band Championships Grade 2 contest can be found here. Tweedvale Pipe Band traveled to Glasgow last Saturday to participate in the largest pipe band contest on the planet, the World Pipe Band Championships. Held on Glasgow Green, the World’s attracted 230 bands from all across the globe to compete for the coveted title of World Champions. 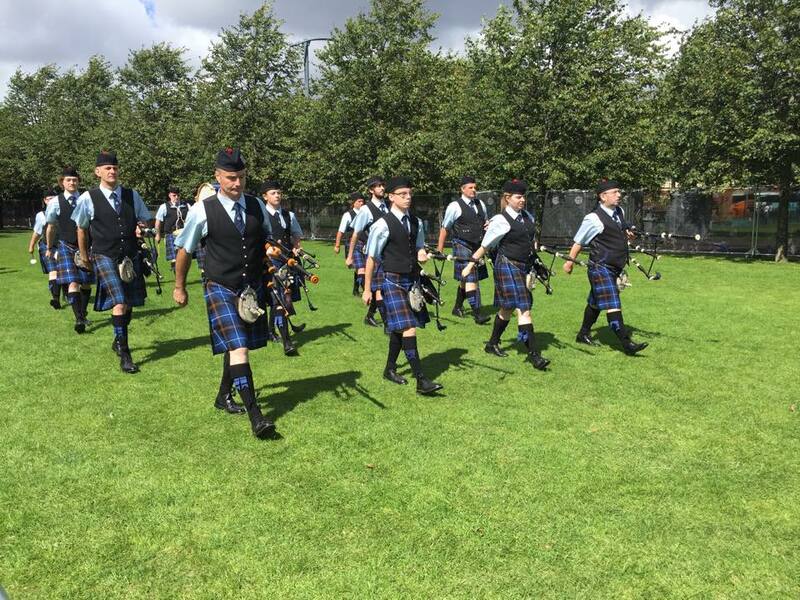 Tweedvale Pipe Band arrived in Glasgow just after 9.30am in order to prepare for their performance and found Glasgow pleasantly dry- the rain that had been affecting the west of Scotland had passed leaving sunny and breezy conditions, though underfoot conditions were definitely soggy. Playing ninth out of twelve bands in the Grade 3B qualifying heat 1 contest, the band put in what appeared to be a reasonably confident and controlled performance of their March, Strathspey and reel set. When the results of the qualifying heats were announced mid-afternoon, Tweedvale had unfortunately not made the 12 band final. 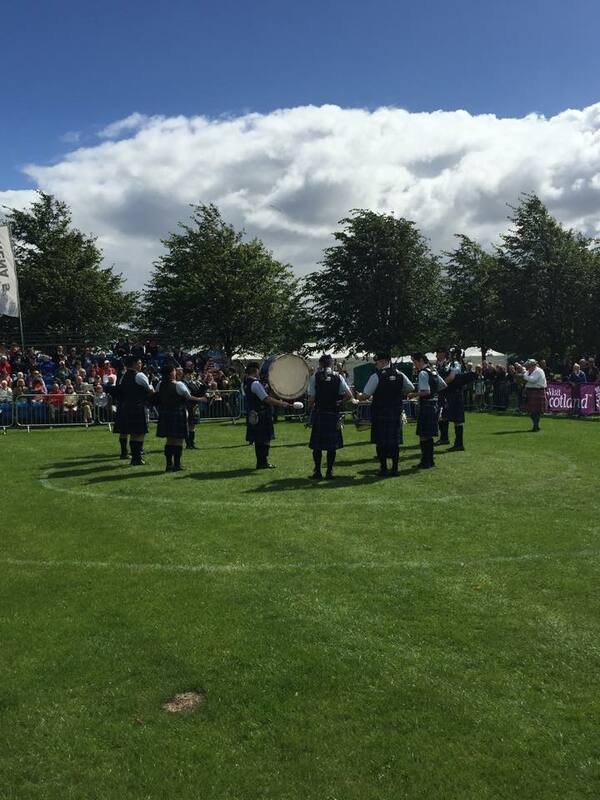 The Grade 3B World Championship title was won by the Colmcille Pipe Band from Northern Ireland. Consultation of the summary sheets after the prize-giving ceremony showed that the band had been placed 11th and 12th by the piping judges, 12th by the drumming judge and 12th by the ensemble judge leading to last place in the qualifying heat. Tweedvale Pipe Band would like to thank BARC Coaches for providing transport to the World Championships in Glasgow. Whilst Tweedvale Pipe Band’s day out at the World Championships was marked with disappointment, two of the band’s alumni had markedly better fortunes. Michael Rutherford, now a tenor drummer with rival Grade 3B band Prestonpans RBL, won the Grade 3B World title for drumming with his corps and his band took 6th place overall. Even better was the performance of Grant Munro, ex-piper with Tweedvale. 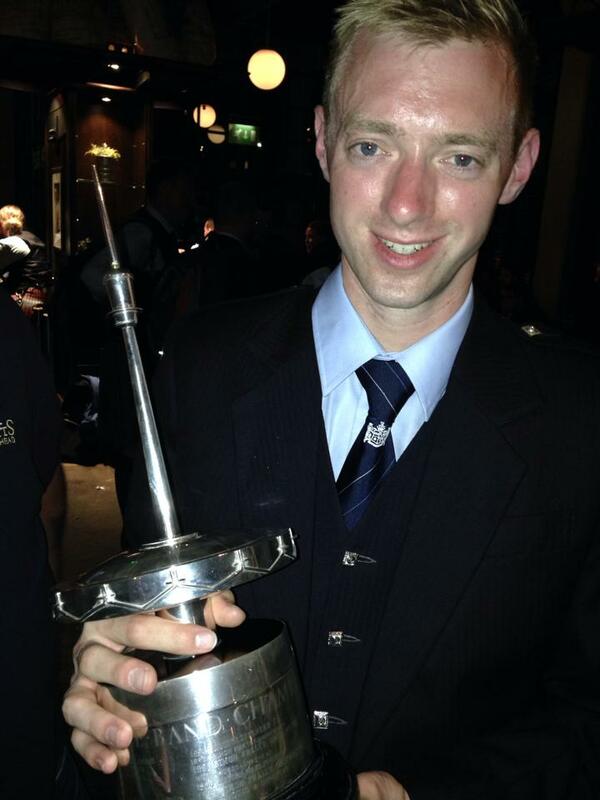 Grant now plays with the Grade 1 band Shotts and Dykehead Caledonia who brought the Grade 1 World Championship title back to Scotland for the first time in 10 years. Tweedvale Pipe Band offers both players their heartiest congratulations on their fine performances at the weekend. Tweedvale’s competition season continues this weekend when the band travels up to Edinburgh to participate in the Edinburgh Pipe Band Championships. 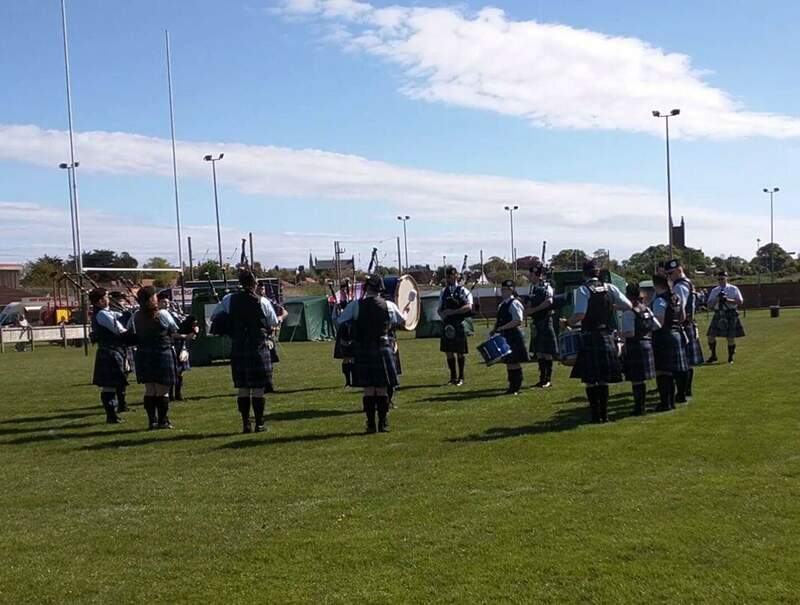 Held at the Royal Highland Centre Ingliston, Tweedvale Pipe Band is scheduled to play 1st out of 6 bands in the Grade 3 contest, and 1st out of 8 bands in Grade 2, both grades being Medley events. The band’s medley set comprises the tunes “Bessie Weatherston”, “Wee Buns”, “Minnie Hynd”, “Lonely Loch Nan Eun”, “Because He Was A Bonnie Lad”, “The Wisemaiden” and “Dancing Feet”. Following a brief break at the end of August, two local pipe band contests at Peebles and Innerleithen follow for Tweedvale Pipe Band to round out their competition season. MANY THANKS TO BARC COACHES FOR SUPPLYING THE COACH FOR TRAVEL TO AND FROM THE WORLD PIPE BAND CHAMPIONSHIPS. The full results of the World Championships Grade 3B Qualifying Heat 1 can be found here. The full results of the World Championships Grade 3B Final can be found here. Grade 3 – March Strathspey and Reel – Atholl & Breadalbane Gathering, Caledonian Canal, The Brown Haired Maiden.